“You are a pretty good mommy.” My 7 year old boy suddenly told me the other day. “Oh! am I?… what made you say that?” I asked. And this is what he replied. LOL! my darling little munchkin knows how to sweet talk his mother. My secrete compartment of sweet candies that I saved from Halloween was discovered (my secret source of 4pm sugar rush). I better find another safe place to hide them. I didn’t give him a candy but I promised I would make him a yummy dinner. 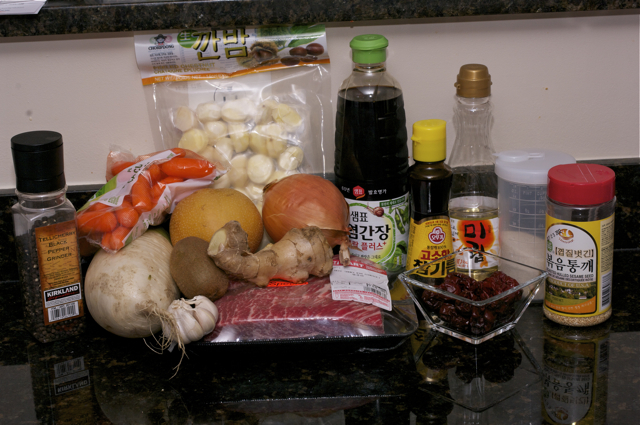 I made Galbi Jjim, the braised Korean beef short ribs. 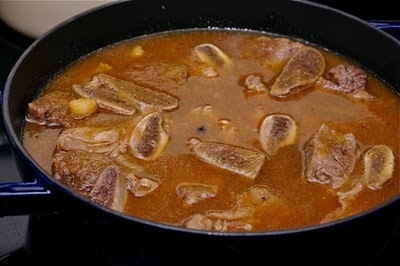 The meat is so tender that it will fall off the bone and the sauce is just divine to drizzle over rice. 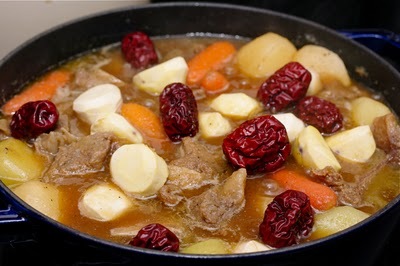 Plus the addition of radish, carrots, chestnuts, and dried dates will throw the dish to the roof. However you need to know that rib meats are usually quite fatty. If you grill them, the fat will drip off. No problem there. But when you braise them, all the fat will melt into the sauce making the sauce too greasy. You need to pre-treat the fat before you add in. 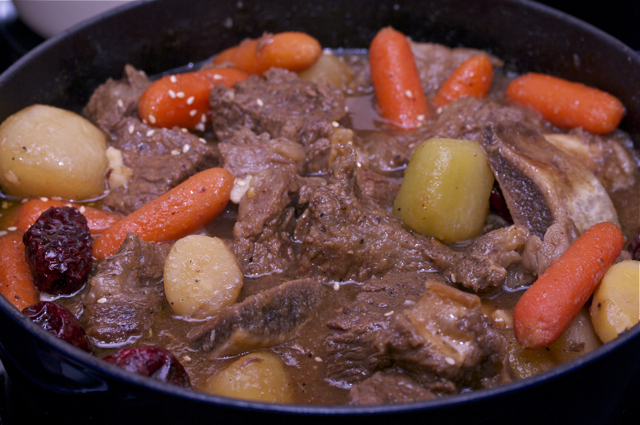 If you follow the direction I give you, you should be able to succeed making the divine braised beef ribs in authentic Korean way with lower fat. Utterly delicious! 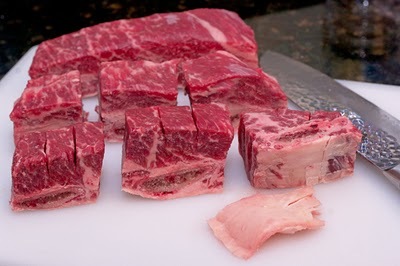 First, cut up the beef so each piece has one rib bone. Cut off excess fat on the outside and give two slits (1/2″ deep) on each piece. Soak them in cold water for 1 hour. Well, this is an optional step to get rid of some blood which cause unpleasant smell. You can skip this step if you don’t care. Boil a pot of water and dump the ribs and cook for 5 minutes. They need hot bath before the big date. This will get rid of lots of fat and unclean gunk from the bones. Drain and rinse the ribs with hot water. Discard the bath water, of course. 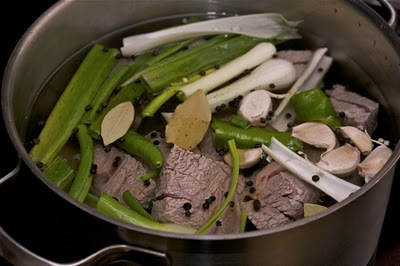 Now, gather up some vegetables, etc to make stock. I used leftover green onion, garlic, bay leaves, peppercorn, green chili. You can add carrots, onions, or whatever to make stock. Put the ribs back into the pot with clean water and the above stuff. Cover, boil and simmer for 30 minutes. And voila! beautiful stock plus loads of fat getting ready to clog my artery. Reserve the ribs, set aside. They look dead and unappetizing but be patient, my fellows. This is perhaps one of my favorite kitchen gadgets, the Fat Separator ! So awesome! 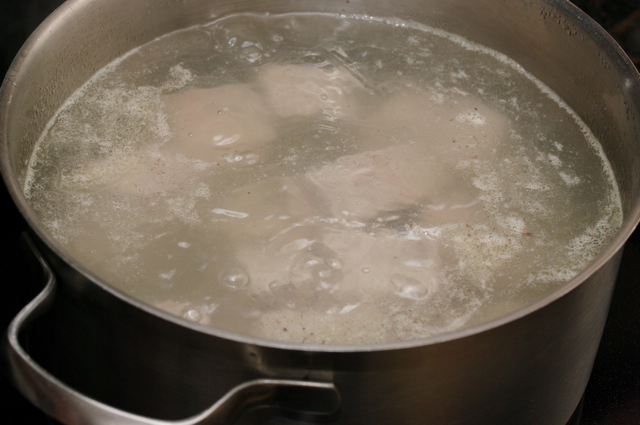 Just pour the stock over and wait 1-2 minutes and you will see the fat floating to the top. Pull the trigger and the stock will drain from the bottom. Stop the trigger when it gets near to the fat layer. Almost fat free beef stock! How divine! If you don’t have this gadget, well… patience would be my advice. Just chill the stock until the fat gets hardened. Then scoop off the fat layer. Time to move on… The flavor crew! 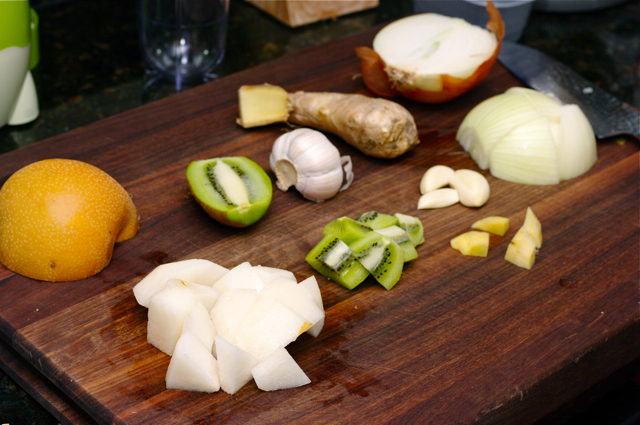 Cut up onion, garlic, ginger, kiwi(optional), and Asian pear. Why kiwi? The acid in kiwi will break down the muscle in beef and yield very tender texture without altering the flavor much. You need a little bit. Keep in mind that too much kiwi will ruin the meat. Put them in a blender and puree their lives until smooth. 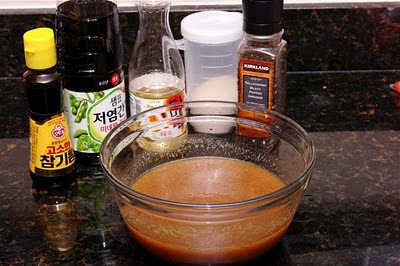 In a mixing bowl combine the fruit onion puree with soy sauce, sesame oil, rice wine, sugar, and pepper, plus 1 1/2 cup of reserved stock. 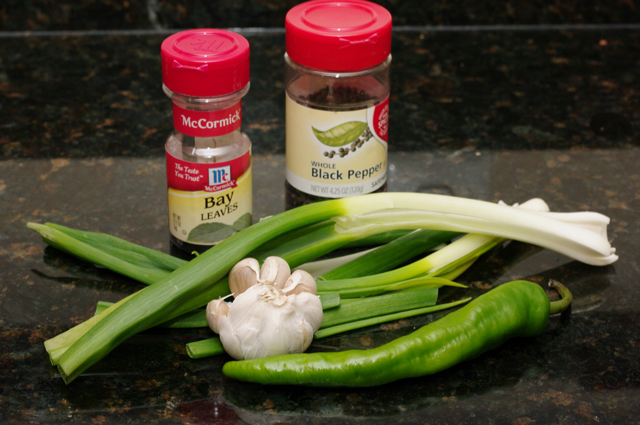 This will be the base of your sauce in the dish. In a braising pot, combine the ribs and the sauce. Cover, boil and simmer for 30 minutes. 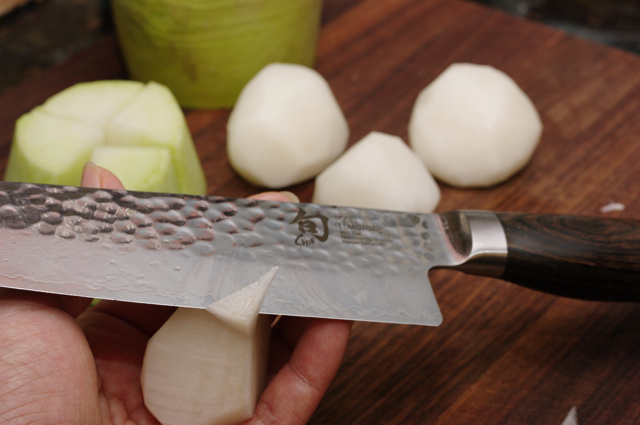 Meanwhile cut up the radish and round the corners. 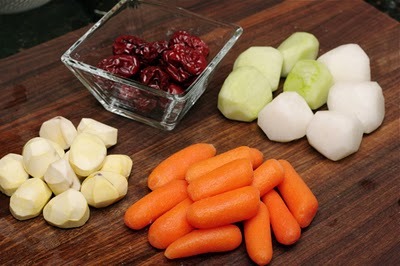 Rounding the edges of radish, carrots, etc will prevent their corners from breaking off, which makes better look and taste in sauce. 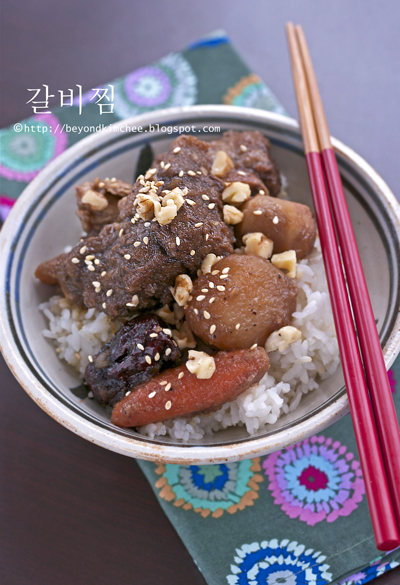 Chestnuts, dates (dried), radish and carrots. I used baby carrots because they already have the nice round corners. Dates and chestnuts are optional. Dates will add another layer of flavor which I love. Add them in the pot, stir. 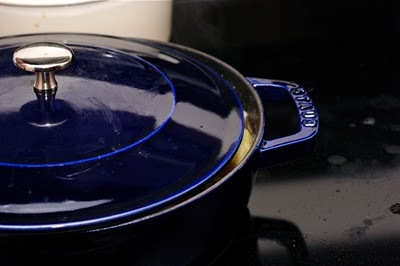 Cover and cook over low heat for 20-30 minutes. If your sauce seems to be too runny, just uncover a little bit so the steam can escape. Sprinkle sesame seeds at last. Done! I highly recommend to sprinkle some chopped walnuts on top when serving. Just perfect finish on the dish. Succulent, tender, melt in your mouth, full of flavor, low in fat, and what else to describe? You probably want to double or triple the recipe because it is SOOOOO good. Leftover is even better. Just reduce the amount of sauce a little bit when you double up the recipe. With all the work you put in, you’d better share with someone you love. Cut the ribs into 3 sections so that each piece should have one rib. Cut off the outer fat from the pieces and give two slits (1/2" deep) on each. 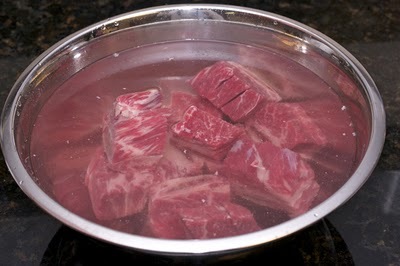 Place them in the bowl with cold water and soak them for 1 hour to remove some blood. Drain. Bring to boil a pot of water and cook the ribs for 5 minutes. Drain and rinse with hot water. 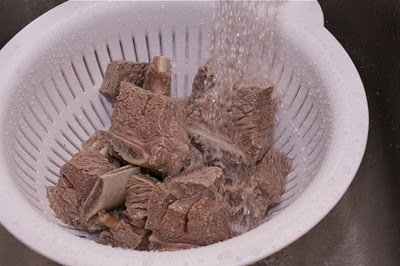 (This will clean the meat and get rid of unclean ingredients coming from the bones) Discard the water. Put the ribs back into the pot and pour 6 cups water and the other stock ingredients. Boil and simmer for 30 minutes. 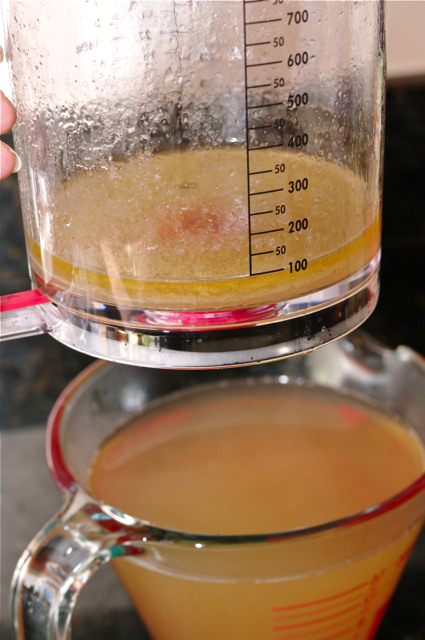 Strain the stock through fat separator, reserve the beef and 1 1/2 cup of stock (Rest of stock can be used for other purpose). Discard the other stuff. 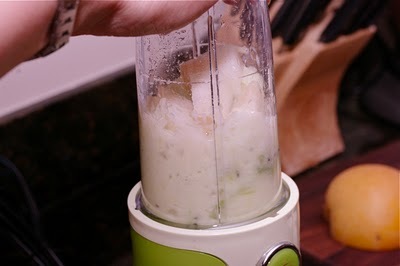 In a blender, puree onion pear, kiwi, garlic, ginger until smooth. Put the purees in a mixing bowl and add the rest of marinade ingredients plus the reserved stock. Mix well. In a braising pot, combine the ribs and the marinade, bring to boil and simmer over low heat for 30 minutes covered. Add the radish, carrots, chestnuts and dates to the pot. Continue to simmer for another 20 -30 minutes. If the sauce seems too runny, open the lid slightly so the steam can escape. Sprinkle with sesame seeds and chopped walnut when serving. Serve warm with rice. Note: Need to double the recipe? just increase amount of marinade by 1 1/2 times rather than 2 times. I know. Many Korean foods takes some time to prepare. But that's why they are so good both in taste and health. 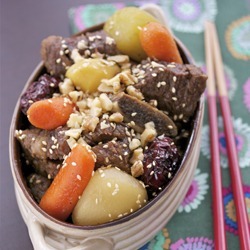 Hope your Galbi Jjim will turn out good. This is/was SOOOO good. I took 2 days to make it - since I don't have a fat separator I needed to chill the beef fat of the stock/sauce. I used quality Angus short ribs that were on sale, and pretty much followed every step as outlined, even the dates and chestnuts. And I cut the corners of the Korean radish, so pretty! My only mistake is that I wasn't really paying attention to the number of ribs - it looks like Holly had 9 rib chunks, whereas I had 16. So, that would explain why I don't have a lot of the delicious sauce, in proportion to the number of ribs. But, it still tastes amazing. The best galbi-jjim ever. OMG! Look sooo good. Can't wait to try this! You are a great cook! I loved to eat but at the same time I am afraid to put on pounds. I would sometimes cook for my husband good food and then I won't eat but watch him. How pathetic!! Hope this is not spicy. My husband can't eat spicy after being married for so many years. I grew up eating spicy food and sometimes I buy kimchee from the store but have to wash away the chili pepper so that he can eat them. Right this moment I want to run out to get the ingredients but I live in the middle of nowhere where Asian food and spices is an impossible wish. Have to wait for next trip to OC. This dish is not spicy at all. It takes some time to prepare but well worth it. Hope you and your husband will enjoy it. 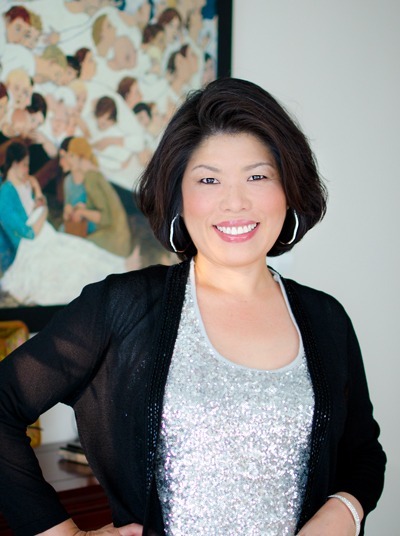 Look for online Asian grocery stores or even amazon.com. They carry some Korean groceries as well. I love your blog. My first visit. I live in Seoul right now. I thought I was one of few moms who saved their kids halloween candies and slowly... ok - not so slowly - go through them for the rest of year. I use them for little treats when they fill up their star charts too. 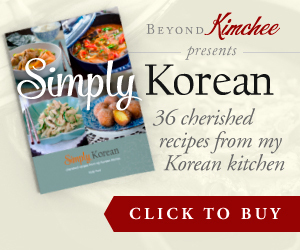 I like a lot of the korean food but have no idea how to make or get the right ingredients, so thank you. (my hubby's a chef...he'll act all surprised when he reads this, even though I've been asking him how to make this dish forever!) :-) Now I don't have to wait any longer. I'm going to try this recipe on the weekend. I look forward to trying out the rest of your recipes. Thanks again! I think I got it from Amazon.com. This is an awesome recipe! It tasted great! I am just learning to cook and it was very easy to follow. 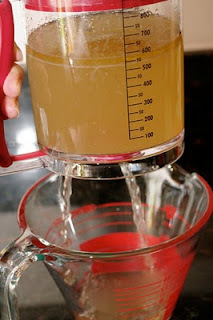 Love the fat separator Idea! I am glad that you liked it. 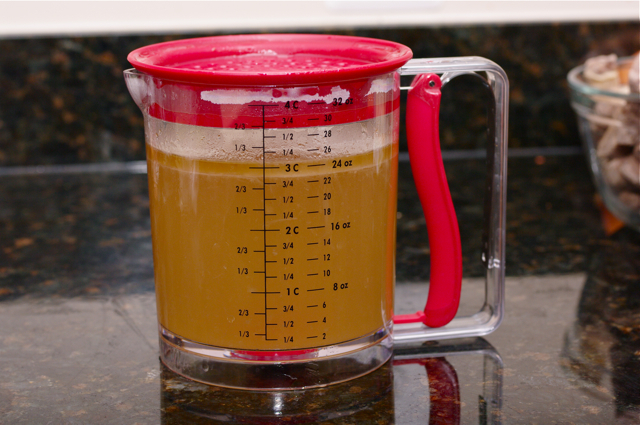 The fat separator is one of mt favorite kitchen gadget. 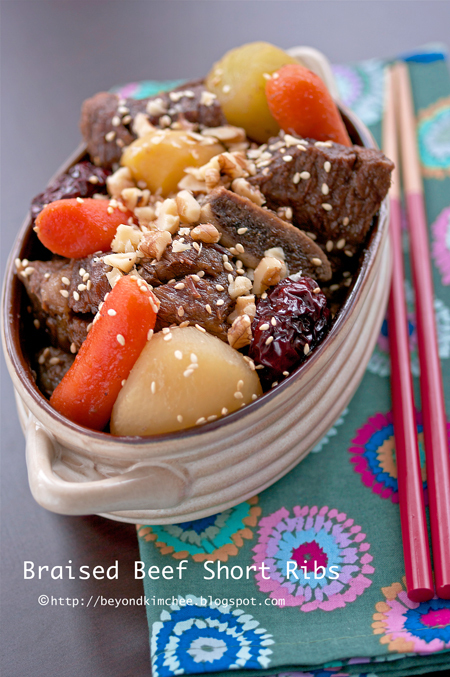 I stumbled upon your site while trying to look for Galbi Jjim recipes. 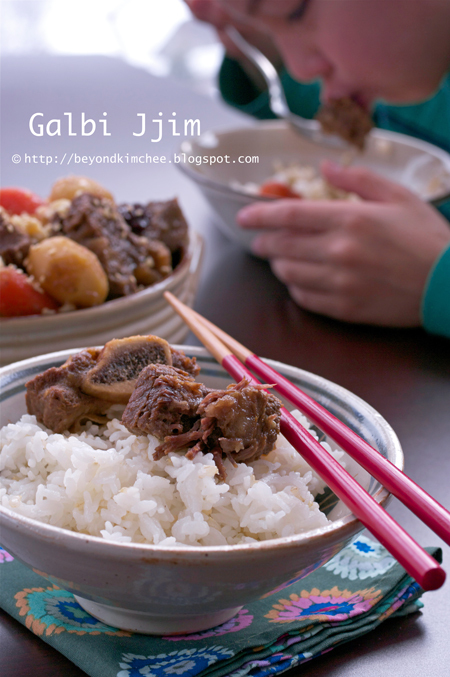 We have had galbi jjim at Korean restaurants and we loved it. I had to try to make it. I had watched many youtube videos and checked many other sites before i decided follow your recipe - thank goodness! It was delicious! My chinese boyfriend loved this dish! I paid $17 and got over 2lbs at H Mart (Georgia) and this was easily 3x the portions I would get at a Korean restaurant for the same price. I also bought some pre-made banchan as side dishes to make our meal as authentic as possible :) I prepared the dish over 2 days. 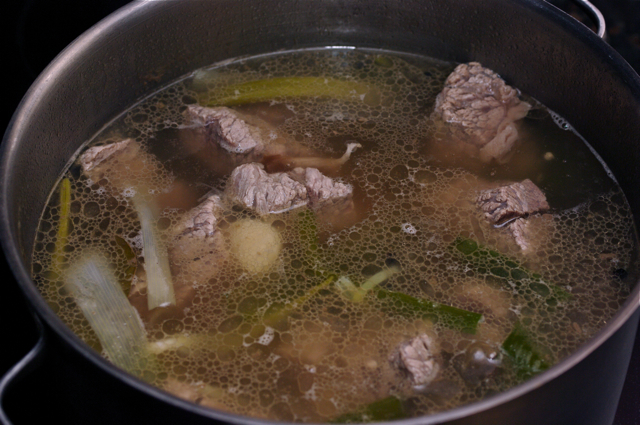 First day i just cleansed the ribs, reboiled the ribs, made the stock (plain ribs + water) and i pureed the marinade. My stock was pretty clear so i prepared the sauce that night. Then i let the ribs sit in the sauce overnight. I was able to do this easily while I was making my actual dinner for that night. 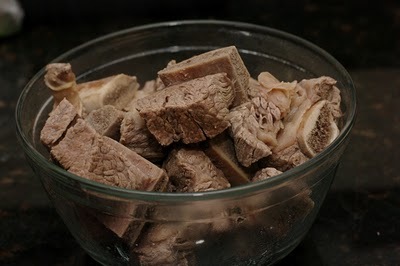 The next day I just boiled, simmered (and simmered) the ribs until it was tender. I didn't have kiwi or dates or chestnuts but it did not compromise the taste at all. In addition i think i used more than 2 cups of stock because it seemed like i had too much ribs and my sauce was not covering my meat. Thank you so much for your wonderful recipe! Like you said, my "future husband" did thank me! That is so wonderful Kathy. Thanks for sharing. I am glad that you and your "future husband" loved it. Since when do Koreans use bay leaves??? It is not an ingredient used in Korean recipes. You are right, bay leaves are not Korean ingredient. However, many home-cooks in Korea nowadays use bay leaves in preparation of their meat to reduce the gamey odor and you can certainly opt out if you don't care for it. It is not the crucial ingredient. Hi Alina, yes, you can skip the rice wine. Happy cooking! Came out great (college student here) :) It's now my regular weekend-make. No more dining hall! Great to hear it came out great! Thanks!